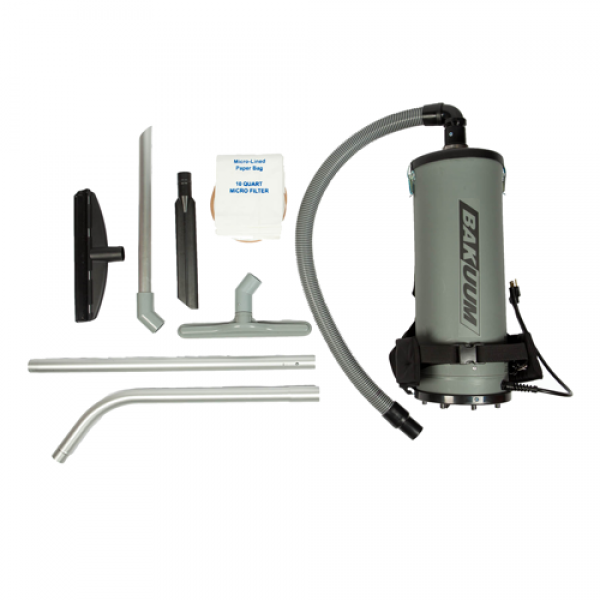 BKU-1.154 – 10 quart BAKUUM® with 1.5″ TS-154 tool set. BKU-1.154 – 10 quart BAKUUM® with TS-154 tool set. 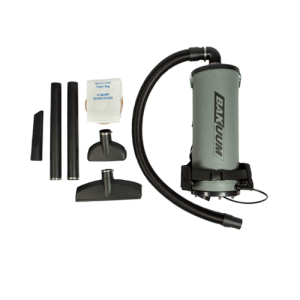 This lightweight 2.3 horsepower backpack vacuum cleaner has a powerful, tapered fan, single-stage lightweight motor which produces a high volume, high lift suction, making it capable of inhaling any debris. It is constructed of durable polyethylene and comes with the TS-154 1.5″ tool set. The BAKUUM® is thermally protected for your safety and comes with a harness system consisting of a padded waist belt, padded shoulder straps, and machine isolation plates for a comfortable custom fit. The BAKUUM® is designed for versatility: Reusable cloth and disposable paper liner bags, and a large selection of attachments for all your cleaning needs.